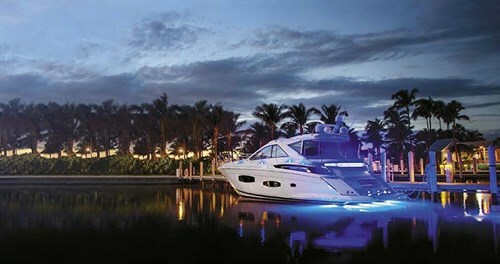 When you’re in Key Largo, USA, and Regal Boats offers you a run in the flagship 53 Sport Coupe, it’s hard to say no. 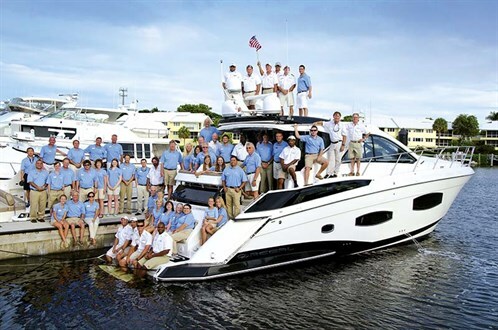 Regal Marine flew me to their 2014 Regal Boats Dealer Conference, held in Key Largo USA, where I had the privilege of reviewing some of the latest luxury Regal luxury boats, from small bowriders like the Regal 2100 Bowrider through to the flagship Regal 53 Sport Coupe you see here. As I boarded the luxurious Regal 53 Sport Coupe via the large rear boarding platform, the opened engineroom caught my eye – in fact it’s that impressive that I reckon it will get a second look from those with no interest in mechanics at all. As intriguing as it was, I opted to leave it for last. Starboard entrance stairs lead you to a spacious and social outdoor aft patio seating and entertaining area, equipped with wetbar and electric grill/barbecue, icemaker, electronic shadesail that extends over the seating area, and Seagrass clip-in flooring rather than teak – which I must say I do prefer as it eliminates the constant need for maintenance and simplifies cleaning. A sliding door then leads to the fully enclosed tinted-glass cockpit that maintains light, but at the same time eliminates glare and does a good job at reflecting heat. With a constant 30°C-plus temperature in Key Largo, along with humidity that felt more like 200 per cent, the 36,000BTU reverse cycle air-conditioning system was most welcoming. 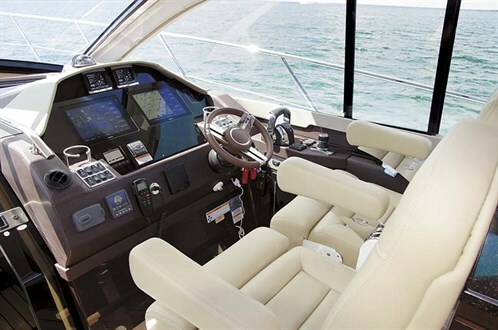 A spacious and luxurious wraparound lounge in the Regal 53 Sport Coupe combines with the upper galley, with refrigerator and wine captain or side-by-side refrigerator, 50in electric-lift flatscreen TV, stunning teak and leather finishes. Besides the really good functionality of this area, I really appreciated how they have managed to maintain the social flow from indoors to outdoors. Simply lock the sliding door off to the side and, with a simple flick of a switch, the side entrance window completely opens and joins the aft patio with the cockpit. Combine that with an open sunroof and you have natural light, full ventilation and of course, an indoor/outdoor social area. 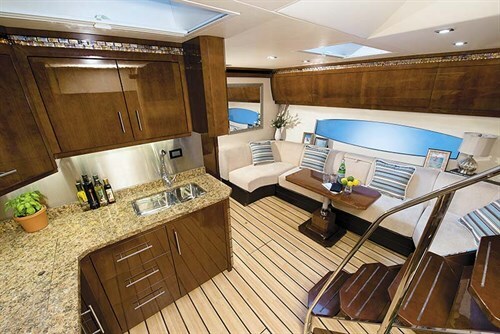 Below deck the saloon offers another spacious layout with 6ft11in (2.1m) headroom, a full galley off to the port side, comfortable dinette on the starboard side, full entertainment centre, and good extra lighting from the large hull side-windows. Not minding a bit of cooking, the galley really impressed me and would be sure to impress anyone with master-chef talents. The stunningly finished cabinetry, along with genuine granite tops, is really classy and with a full size fridge, microwave, electric two-burner stove, heaps of storage and being fully equipped with dishware and flatware, it’s just a matter of loading it up with food and drinks. 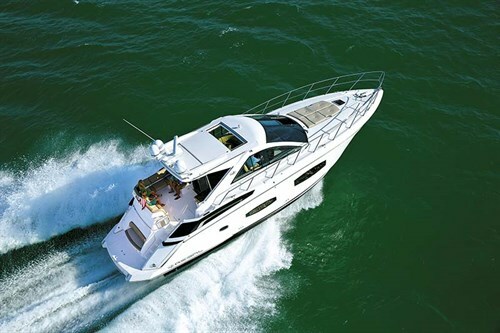 The Regal 53 Sport Coupe has a number of great options available when it comes to cabin allocation and layout, including fore and aft staterooms with queen berth, double berth with bunk, or even a third stateroom with bunks for the kids. A fantastic feature is most certainly the Olympic-sized master stateroom with full, single level walkaround space, as well as separated electronic head and shower dressed in beautiful granites and teaks. Spacious cabin layouts like these are definitely a big plus when having extended stays onboard or extra guests. The forward stateroom, with double bed and bunk, was yet another good example of positioning within the layout to make it as comfortable as being at home – probably even more so for some. The combined head and shower is again spacious and a nice feature is having the extra external door opening onto the saloon for guests. Overall the internal finishes are absolutely stunning, from the teak flooring, to numerous granite top options, to beautiful cabinetry, and carpeting and seating fabric options. There are numerous options available to suit different tastes, so many other features on the Regal 53 Sport Coupe just can’t be mentioned. Engine rooms are always difficult areas to set up well due to the vast amount of electronics and mechanical fittings needed to run the larger boats. Stepping into the Regal 53 Sport Coup’s engineroom was literally a breath of fresh air in comparison to the standard hot and sweaty engine pits that everyone tries to avoid going into. Pre-cooled through the aircon blower and having close to 7ft (2.13m) headroom, the engineroom is an area worth spending half an hour in on its own. 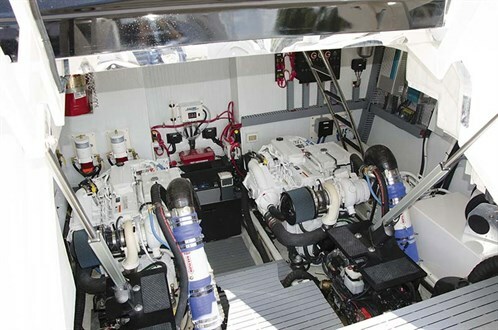 Twin 550hp Cummins turbo-diesel engines with Zeus pods are the driving power of the Regal 53 Sport Coupe, along with the generator and dozens of other operational fittings and accessories fitted within the engineroom. To cut a very long story short, this engine room is workable from any point without overheating yourself and bashing your forehead on anything. It’s by far one of the neatest and spacious enginerooms I’ve come across and with such a neat fit-out and simple access to all components, it’s a more of a pleasure to be in rather than not. One of the main contributors to the performance on the 53SC is the Zeus propulsion system, another item virtually worthy of a review on its own. It’s designed to increase performance, fuel-efficiency, protection and vessel control. Through SmartCraft innovation the Zeus system provides total simplicity for operating and manoeuvring. Underway, constant tab adjustments compensate to suit acceleration out of the hole, as well as when on the plane, to maximise efficiency throughout the rev ranges. A big bonus is the joystick feature and operation for low idle and docking purposes. One-hand operation on the joystick basically gives you the ability to walk the boat sideways off the dock or pontoon, spin the boat on its own axis, and allows far better control when navigating through tight channels or canals. Docking any boat of this size can be quite daunting, but the Zeus radically changes that, along with your attitude and confidence. Other features incorporated into the Zeus include a tunnel-mounted pod with rear-facing propellers to protect the drive. This kind of mount reduces the chances of debris damage on the drive and props and in the event of something hitting the drive, the skeg will shear before any other damage can take place. Another attractive feature of the Zeus system is the Skyhook – an integrated spot-locking system through the autopilot. If you need to tend to something onboard and have to leave the controls, or need to wait in line for fuel, or there’s even a lock to open, it’s just a matter of hitting one button and the Skyhook will hold your position until disengaged. It’s a very technical system, but definitely well worth having as it really makes a substantial difference in simplifying manoeuvrability. The twin 550s produce a gutsy hole-shot for a boat of 53-feet and what really impressed me was the limited bowrise produced on acceleration. The captain’s vision is consistently clear through the front and side screens with very few blind spots, if any. Up on the plane the tranquility within the cockpit was noted and besides hearing our own voices, the noise level from the motors is merely a pleasant murmur in the background. Remarkably, we sat a very comfortable 25kts, with revs hovering around 3000rpm – and when opening her up, she cranks up to a comfortable speed of just over 30kts at WOT. Most of the time this style of boat is driven accordingly, in cruise style. However, in this case, I experienced the 53SC being put through similar paces to a smaller sports boat. Lock it into big turns at high speed, chuck it into a few donuts, slam it through some serious chop and wakes – you name it, we did it … and man, I couldn’t fault the ride. One thing that did surprise me was when full locking into a turn, the hull speed hardly dropped back – very impressive. This 53SC had the optional Seakeeper gyro-stabiliser fitted. I’ve seen demos on them before but never been on a boat with one fitted. Considering that it hardly takes up a square metre of your hull, I honestly wasn’t expecting too much out of it. Man, was I wrong. We jammed the 53SC into a few donuts to create a messy wake to test it out and while doing that a 45 Sport Coupe came flying past to add an extra 1m or so of wake to the mess. Without the Seakeeper on, the Regal 53 Sport Coupe got a good roll going like any monohull would in this circumstance. The Seakeeper was then engaged, allowing the hull to roll a few times to read the conditions – and then there was an instant, complete, 90 per cent improvement on the stability, going from wobbling all over the show to a level stability within a few seconds. Underway the Seakeeper works just as well and really does make that much of a difference to the ride. The Regal 53 Sport Coupe boasts an ideal package suited to both indoor and outdoor living, as well as being a boat for all seasons. Sophisticated and refined finishes add to a luxurious feel throughout and with the numerous customising options available it can be easily transformed to suit any taste. It’s a classic, luxury entertainer and no doubt one of the classier sport coupes on the market. See the full version of this review in Trade-A-Boat #460, December / January 2014. Why not subscribe today?